Y'Know The Editorial Cartoons in The Onion? Time Magazine Punts on "Person of the Year"
Hey, I'm a "Usual Suspect"! How much did Thing 2 want to see Eragon? A few weeks before it opened -- when the ads were running relentlessly on kids' TV -- he changed his then-favorite game (in which he was a kitten or puppy who'd fallen into a stream, which I saved inadvertently while fishing and brought home to love) into an Eragon version, in which he pretended to be a dragon egg and I was the boy. I was a little worried that the movie would be too much for them -- they haven't seen a live-action movie with a lot of violence yet, and both of them are softies. (Thing 2, my five-year-old "pretend I'm a kitten" boy, is the more tough-minded of the two, just to give you an idea.) But there's no real blood here, and only an Obi-Wan-esque Sacrifice of the Mentor scene for serious pathos, so they got through it just fine. And Thing 2 announced, in the car afterward, "That was totally awesome!" For adults, it's not as exciting, but I thought it was better than most of the reviewers seemed to. Sure, it's basically a Cliffs Notes fantasy movie -- look! a farmboy wow! check out the destiny! instant grown-up dragon! mentor! evil wizard! platonic love interest! minor confrontation! hidden fortress! major confrontation! is she dead?! of course not! come back for the sequel! -- but the acting was professional (even if the dialogue was a bit bland) and the effects were always believable. I lived through the '80s fantasy-movie boom, and this is better than almost anything from then (except maybe the first Conan movie). It might not be a terribly high standard, but I enjoyed the movie, and I'm happy that a decent, big-budget fantasy movie (made from a book) is such a huge financial success. I want to see more fantasy movies (of all different kinds, but especially ones I can take the boys to), so success is a good thing. 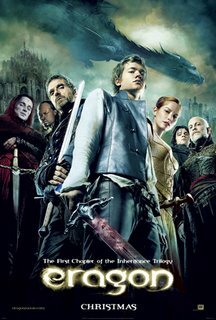 Anyone looking for another Lord of the Rings will be disappointed, but I did think it was better than Chronicles of Narnia.